Home » Does the High-End Jura J9 One Touch Coffee Maker Live Up to Expectations? Does the High-End Jura J9 One Touch Coffee Maker Live Up to Expectations? 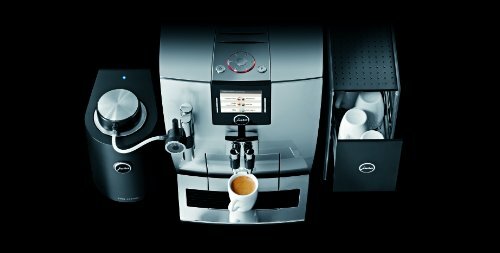 The Jura Impressa J9 One Touch TFT coffee machine is a high-end brewer with milk teaming/frothing functionality (but no milk wand). 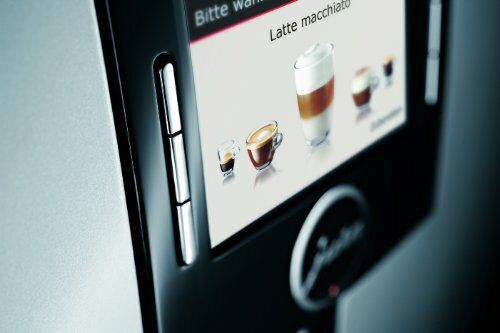 The J9 is controlled via rotary selection LCD color control panel that allows the user to choose their beverage, as well as program temperature, strength, and volume. 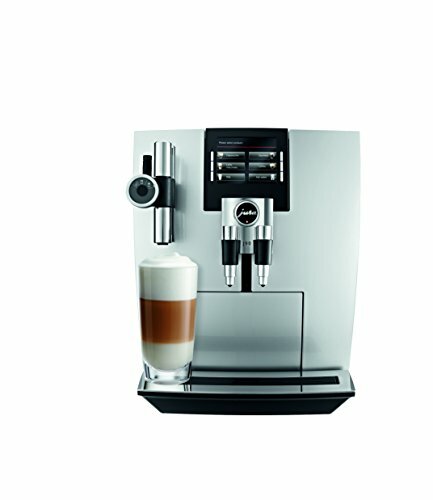 With the J9, the user can make a range of espresso and milk-based beverages, including Americano, cappuccino, and latte macchiato. Additional choices include ristretto and ristretti. There is also a hot water dispenser and a facility to dispense hot milk. The J9 is compatible with whole bean coffee and pre-ground. It is packed with impressive technology, including a Thermo-block heating system and integrated cleaning and descaling program. While not perfect, the J9 is a quality coffee machine sold at a premium price. While it doesn’t have a milk wand, the J9 is sold with a standalone 20oz stainless steel vacuum milk container for frothing and steaming milk. It connects to the coffee machine via plastic tubes. At the top of the J9, you’ll find separate compartments for ground coffee, the grinder, and the removable water tank. There is also a compartment that houses a coffee scoop and changeable milk nozzles for cappuccino and latte macchiato. There is a good-sized 8.8oz whole bean hopper and a sensor that can pick up when the ground coffee compartment is full. To get started, ensure the large, 71oz removable water tank is topped up and turn the machine on using the button at the top of the machine. A message on the fancy LCD color control panel tells you the coffee machine is warming up. This is a pretty quick process and within a few seconds it’ll be ready to brew. During the warm-up, the J9 will undergo a little cleaning process to flush through the nozzles. As discussed in more detail below, maintenance of the J9 has been simplified, with an integrated rinsing, cleaning, and descaling program, as well as a CLEARYL water filter cartridge. On the front of the J9, you’ll see three nozzles. The two in the center are for dispensing espresso shots. They are butterfly spouts, which means you can dispense espresso into two separate cups or demitasse at the same time. Unusually, the J9 can actually produce two shots in the same brew cycle – just pick the option from the menu. To brew, you simply select the drink of your choice, make any required adjustments, and the J9 does the rest – grinding the beans, dispensing the espresso (complete with impressive crema), and steaming the milk to the correct texture. The milk heating process is actually controlled by a separate dial, which is found on the nozzle to the left of the machine (where the tube connects). 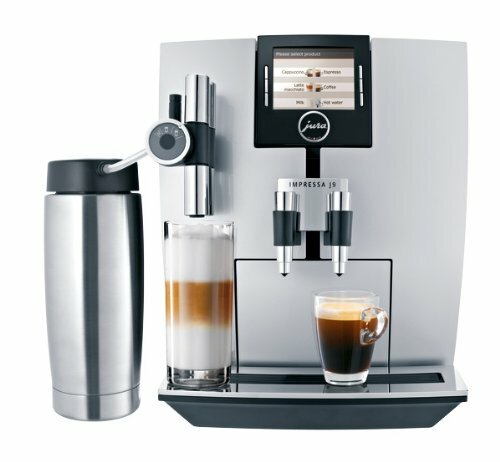 This allows you to select what type of drink you’re making (cappuccino or latte macchiato) and thus tell the J9 how to prepare the milk with the correct texture and foam. 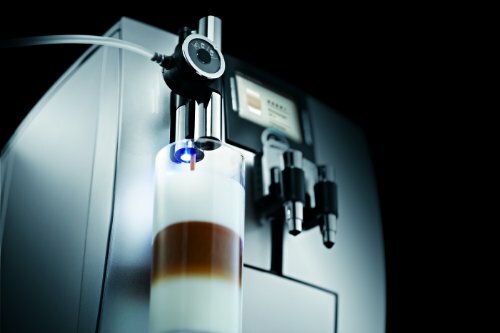 The milk is siphoned from the standalone milk jug via the tube and dispensed into the cup, mug, or glass, while the espresso is ground in the main brewing unit and dispensed from the same nozzle. This process is not quiet but does produce a nice-looking beverage with good quality foam. As you’ve probably noticed, the J9 boasts lots of premium features, as you’d expect on a machine sold at this price point. 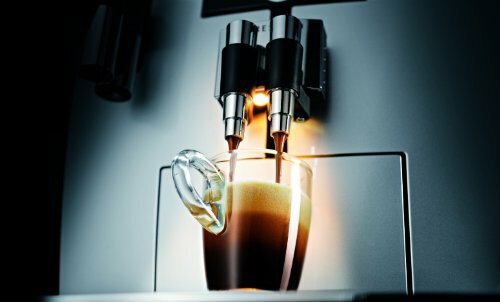 One nice thing about the J9 is that the rotary screen features pictures of all the different drinks it can produce, so you can scan through and pick what looks the best – the layered latte macchiato being the prettiest! These are also listed in the menu. The color panel screen is easily controlled using the top-mounted dial. Simply turn and press to select the desired option. Beyond picking the type of drink you want, you can choose the temperature, strength (5 settings – from extra mild to extra strong), and volume. The screen also tells you what it needs, such as adding extra beans or filling the water tank, and what it’s doing, such as going through a rinse cycle. You can choose to display the text in multiple languages, so if you have some time on your hands, you can change it to something random and challenge yourself to find the right option to change it back to your preferred language! The unit has an energy saving mode that, again, you can adjust to tell the machine how long it should be idle before going to sleep. The jury does seem to be out vis-à-vis the milk container. On the plus side, it can store cold milk for up to 8 hours and produces great milk texture, courtesy of Jura’s ‘fine foam’ technology. On the negative side, it is quite awkward to use, as the tube has to be inserted correctly to work and it needs to be cleaned out after each use. In addition, if you’re a skilled or newbie home barista you might find you miss the control a steam wand offers. It also doesn’t work that great with non-dairy milks. Prevents Hard Water Issues: The water tank is fitted with a filter, and the machine is adjustable for water hardness. Built in Automated Cleaning: The J9 performs a light rinse cycle before and after each use. Some Manual Input Required: It is important to keep the milk tube clean and to periodically run through some coffee machine cleaning solution and flush it out with clean water, as per Jura’s instructions. Exterior Cleaning: The outside of the J9 can be cleaned with a soft cloth – however, be aware that casing is made from plastic, so should not be cleaned with anything abrasive. You can check out the full user manual section on this here. This is a premium one-touch coffee machine that offers lots of functionality. The J9 offers good control over your beverage, with a simple and user-friendly interface and lots of programmable options. The machine offers the full-range of espresso and milk-based drinks. The vacuum milk container can produce good milk foam and the machine benefits from a commercial-grade solid steel conical burr grinder. There is no separate milk wand to steam the milk. Some third-party reviews have flagged issued with milk and espresso temperature. In addition, the plastic casing makes the $2,400+ machine look a little cheap. In a sentence? The Jura J9 is an easy-to-use single-touch premium coffee machine that can produce a range of espresso and milk-based drinks – but while it certainly has all the bells and whistles, there are questions over whether it really is worth the $2,400+ price tag. Check out the latest prices and discounts here. When you spend over $2,400 on a coffee machine, it’s reasonable to expect a full range of features. While the Jura J9 has plenty to offer the home coffee enthusiast, there are a few omissions that make it a less attractive purchase. The most glaring of these is the lack of a separate milk wand, which reduces some control over the steaming/frothing process and also requires fiddling around with tubes connected to the vacuum milk container. There are also third-party issues relating to beverage temperature and problems with dispensing the espresso. That being said, the J9 does offer the full range of coffee/milk drinks at the touch of a button. The color LCD rotary control panel is user-friendly and provides a good level of control over the coffee-making process. Internally, there are all kinds of premium features and technology. But for this price, purchasers have a right to be fussy and unfortunately, our verdict seems to be that the J9 just misses the mark. IF you have the budget, this IS a cool toy to try…. just don’t expect perfection.